Our time in the lower 48 states was quickly drawing to an end and we were really excited to get on the ferry and see Alaska. It has been on our bucket list for many years but we never really knew how we wanted to explore it. Neither of us are cruise ship travelers and we didn’t think that driving our Subaru to Alaska and camping in tents was the ideal vacation. But we had a lot of driving to do before catching our ferry from Bellingham, WA to Wrangell, AK. Our first stop was at a Ford dealer in Sacramento, CA to check on a brake issue that cropped up as soon as we left Grass Valley. It seems like there is always something going on with the vehicles that we own! Once the brakes were fixed we drove to Ashland, Oregon. Overall, this wasn’t the most exciting week for us on the trip since most of the time was spent retracing our route back through Oregon then onto Washington, cooking, eating, running and sleeping. The runs were our highlight during this week. We enjoy getting out for a run as often as possible wherever we stay. It’s a great way to see a neighborhood and enjoy the outdoors. We made running a priority this week since we would be spending so much time driving and it would be the only exercise that we would get. Working out with regularity is one thing I miss on this trip. It’s been tough getting into a regular workout schedule but we can at least manage a weekly run. Our second day was a relatively short drive to Portland so I could stop by Powell’s Books the next day to pick up the missing CD from the audio book “1,000 Splendid Suns” by Khaled Hosseini which I purchased during our earlier visit. (As an aside, I loved the book and the characters Khaled created. I often think back on the lives of Laila and Mariam, the two protagonists of the story, and wish I could have a little more time with them.) We were living in the FJ when we visited Portland earlier in the trip. Compared to the XP Camper, our FJ was a dream to drive around the city. With the XP, parking is difficult because many lots have height restrictions that our XP exceeds and trying to parallel park this beast is almost as difficult as finding a spot long enough to fit into (we’re about 21 feet long)! So instead of parking, Darryl drove around the block, and around the block, and around the block…while I ran inside to make the exchange. It was a pretty easy decision to get back to the highway rather than dealing with the Portland traffic so we decided to continue up the coast of Washington to the Screamin Eagle Campgrounds just outside of Ocean City, Washington. The cool thing about this campground is that it accommodates horses so I spent the following morning chatting with a couple about their Standardbreds. If you have ever watched harness racing this is likely the breed that was racing. They are the fastest trotters in the world and many of them have a unique natural gait called the pace, a two-beat lateral gait where the front and hind leg of one side move in unison. After our conversation I decided that I’m not quite ready to ride a breed that can pace a mile in under 2.5 minutes! 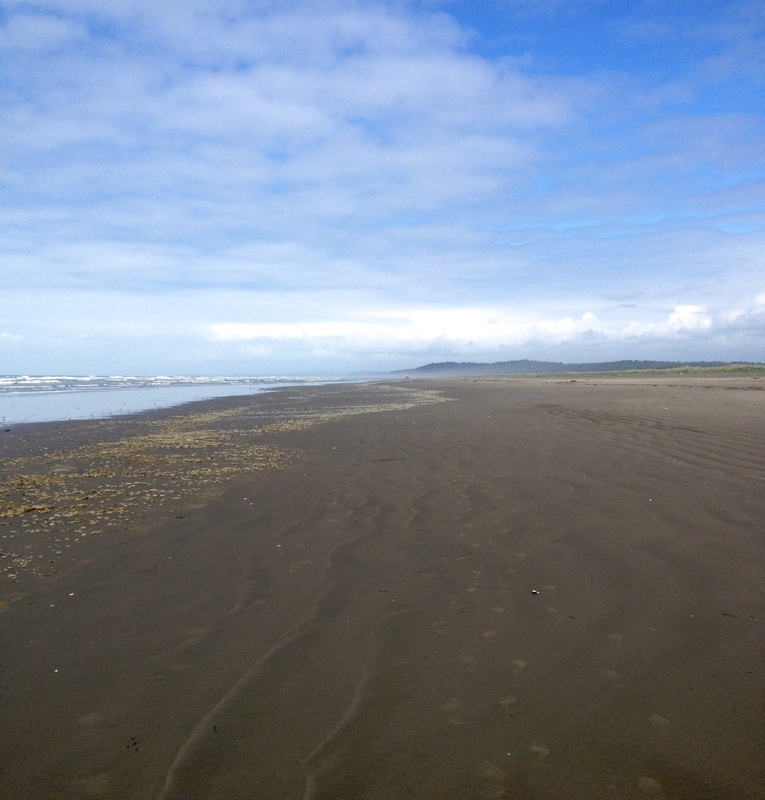 This was our running route on Washington Beach just behind our campsite. 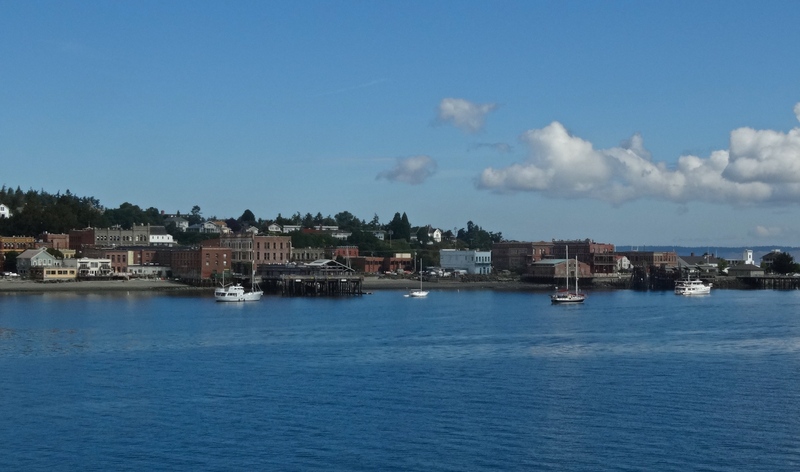 We made it to Port Townsend, Washington near the end of the next day. We were hoping that we arrived early enough to get an RV spot in the cute historic downtown area which also has a killer view on the water. It’s a popular spot but with very few spaces available so we weren’t surprised to see that it was completely full by the time we rolled in. Our only other option were the fairgrounds so off to the less scenic but spacious fairgrounds for our evening in Port Townsend. There were plenty of spaces available with clean bathrooms but without the gorgeous views and easy access to the downtown. The “early bird catches the worm” but Darryl and I are rarely early birds. Maybe this will change somewhere along the trip…but I highly doubt it! We did have to set our alarms for our early morning ferry departure to Bellingham, WA. After packing up the XP the following morning we went into town to find a hot breakfast before boarding the ferry. It seemed that we were up far too early for most of the cafes as we walked by closed sign after closed sign. Darryl asked a couple that was walking along the street if they knew of a good breakfast place. They were on their way to their favorite spot, Sweet Laurette Cafe & Bistro, and invited us to come along with them. We ended up having a wonderful breakfast with them! As chance would have it, he was born and raised in Alaska and had stories to share with us of his life in Alaska. He is also an avid cyclist who takes cycling vacations throughout the country while his wife drives a support vehicle for many of these journeys. We were so caught up in their stories that we almost missed our ferry! The check hadn’t arrived yet and we had to boogie!! They were so kind to treat us to our breakfast as payment for the many meals that they received on their journeys. Their only request was that we pay it forward to somebody else that we meet in the future. I completely forgot their names but I’ll just refer to them as our “Road Angels”. We made it to the ferry with plenty of time to spare. 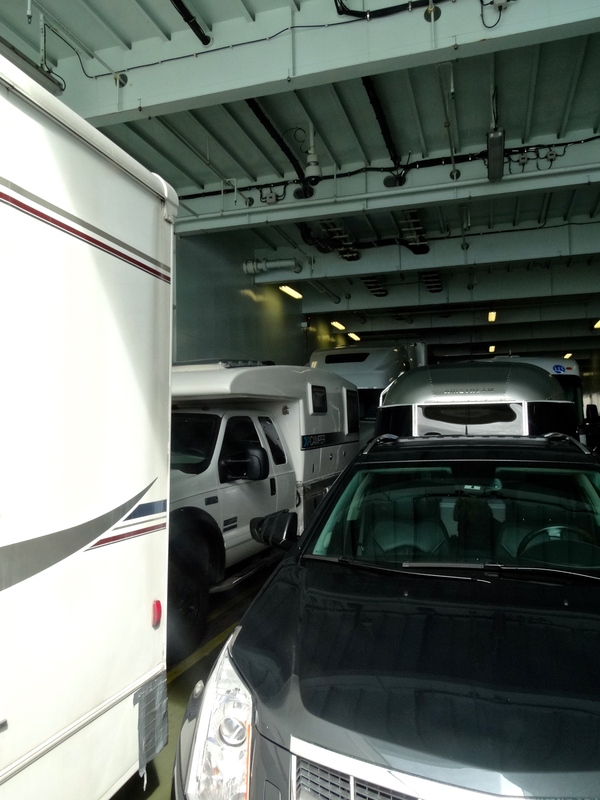 We didn’t realize that there was so much time spent waiting to load when taking a ferry! 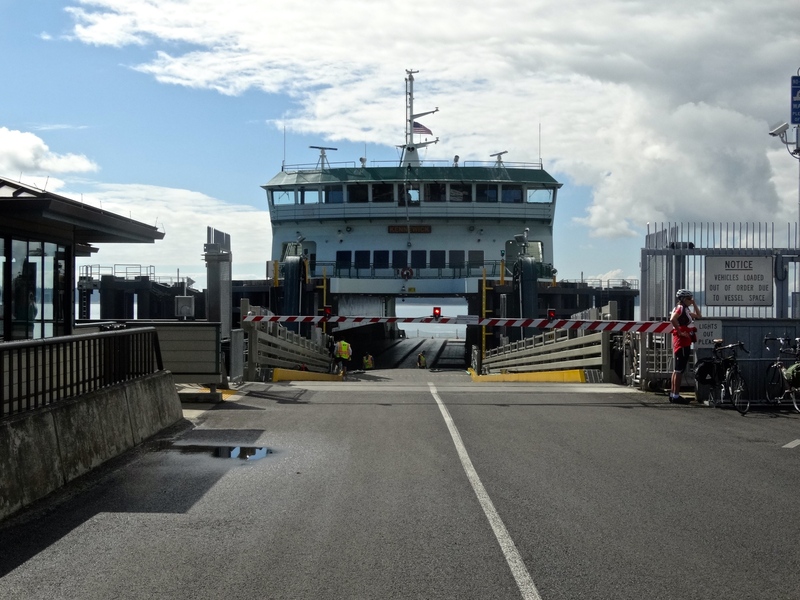 This first ferry to Bellingham took only 30 minutes. 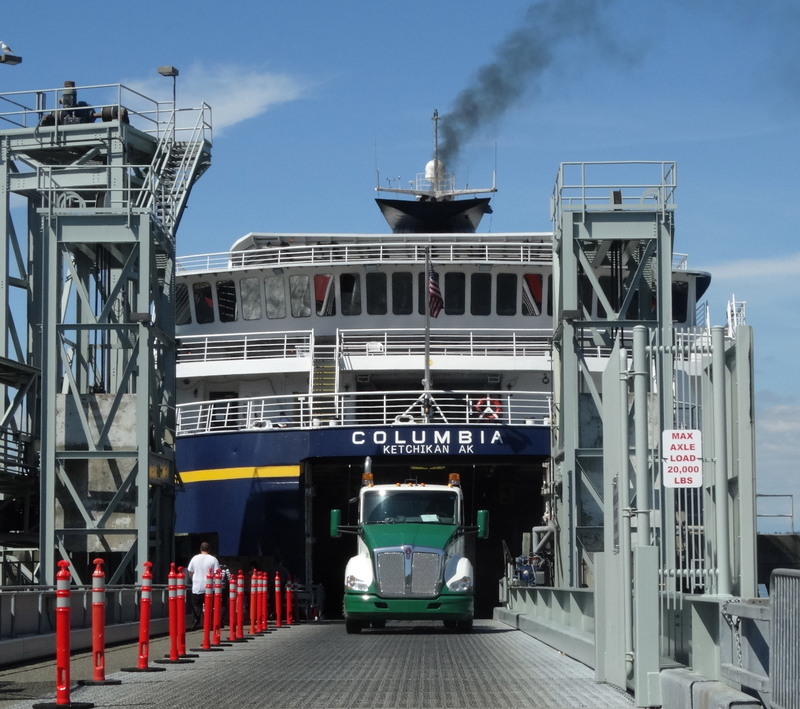 Then once in Bellingham we had time for a quick lunch and then off to the Alaska Marine Highway ferry loading docks to wait for loading. During the long wait we had lots of time to check out the other vehicles making the trip to Alaska. Our XP caught the eye of a few admirers and we passed the time exchanging stories with our fellow travelers about our journey and they shared with us their adventures. I was surprised to meet so many people that travel to Alaska year after year for weeks at a time. And here I thought that our allotted six weeks in Alaska would be plenty of time to see the state. Now I’m having my doubts considering the extensive amount of time people spend in Alaska and yet they feel that there is so much more to see. We’ll soon find out if we budgeted enough time! If not, we can always make it back another day. This week went by so quickly with much of the daylight hours spent driving that I didn’t take out my camera much. The photos below are the best that I can find in a very limited supply! I’m sure that once we make it to Alaska I’ll have more impressive photos to share. In the meantime stay tuned for our next update as we arrive in Alaska! All ready to board the Washington Ferry from Port Townsend to Bellingham! They really cram us in! A last look at Port Townsend, WA. All aboard the Alaska Marine Highway!! These ferries are huge!